I read this book about Helen Keller at the NYSC orientation camp at Ise Emure Ekitit State on the 30/11/2011 I still refer to it as the greatest inspirational story I read at the Youth Camp. In this short review I share lessons from this great woman. 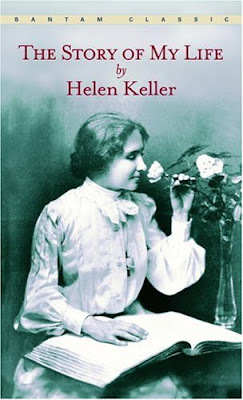 Helen grew up without the sense of sight and sound but eventually learnt to conquer this and became a poet, author and a great inspiration to the world. 1. We give up so much more by giving up. 2. The key of persistence will open the great door of impossibility no matter how long you try. 3. Everything has a name you might not just realize it yet! 4. The greatest key in her life was the strong desire and her unbeatable passion for learning. She knew what she wanted and would never be defeated before or while fighting for it. 5. She met and had contacts with many great people of her time, like Presidents of United States; President Cleveland and President Eisenhower, Mark Twain, Dr. Dale Carnegie, some Harvard Professors,Instructors and her personal Teacher; Ann Sullivan. 6. She refused to pay attention to what others would say about her disabilities or how she chose to rise above them, she refused to attract pity or pampering, and she chose to reach out to what God has for her in the Universe. 7. Most times our destinies which we must fulfill, lie in seemly unachievable and impossible realms, which we just must reach to take hold and make happen, for the greater good. 8. Opportunities are knocking, mostly in the form of great dreams, a difficult offer, or a puzzle or a question which we must ask ourselves over and over to reach for an answer in our subconscious.